HEAVY PLANET presents today's "New Band To Burn One To"...REVEREND SNOW! Rising from the smokestacks of "steel city" Hamilton, Ontario comes Reverend Snow. 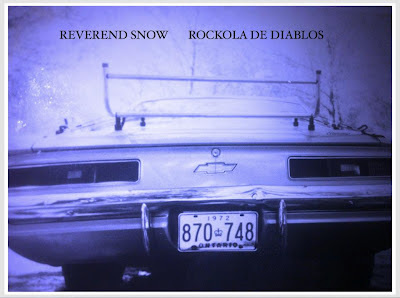 Reverend snow fuse hypnotic solos, fuzzed out guitar riffs and chaotic drums, putting together their debut album "Rockola de Diablos". Although RS was formed less than 2 years ago, the 3 members had been friends for many years in Ontario where they all grew up. They had played in previous bands, (Daze, Cream Judge, Hi Tower), playing mainly classic rock, power pop and hard rock....but the drive to make a record influenced by their idols (Black Sabbath, Kyuss,) was always on their minds. Their debut, Rockola De Diablos, is full of heavy riffs, smooth grooves and catchy chorus'. The record is heavy, reminiscent of the steel manufactured in their hometowns north end. For Josh Dion-Broadley (guitar, bass, vocals), Rob Tomalty (guitar, bass) and Mark Zavarise (drums), the album came together very naturally, entirely written, recorded and mixed by RS. Album #2 is already in the plans..
"Growing up in a "steel city" as well, I can associate with Reverend Snow more so than others. My father was a steelworker, my grandfather was a steelworker, and well, I sell industrial supplies, so it all comes around full circle. Reverend Snow is a band that takes all of their influences and melts them together for a thick slab of hot molten heaviness. The music has a wonderful fuzzy feel, with elements of desert groove, hypnotic psychedelia and heavy blues. With riffs as heavy as 350 tons of molten pig iron, Reverend Snow pours their soul into an extremely well-written and well-played debut . The band has made their entire album available for free which you can download at the link below." Sorry. It looks like the link is no longer valid.